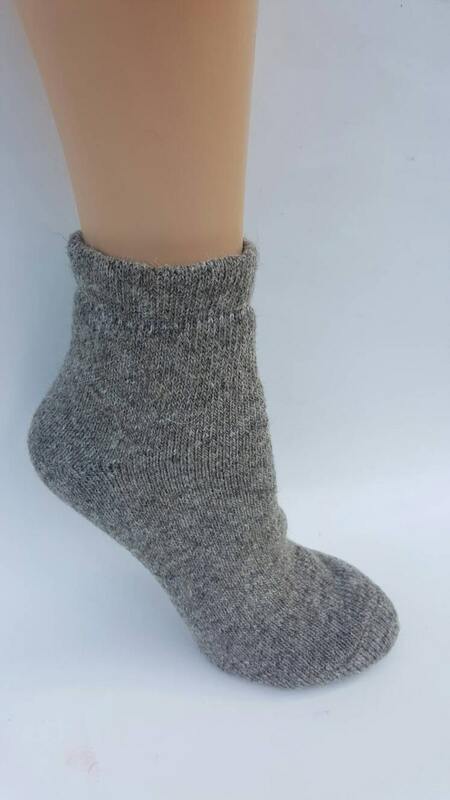 Warm your feet with home grown suri alpaca 62% along with 17% usa merino wool, and 21 nylon spandex blend. 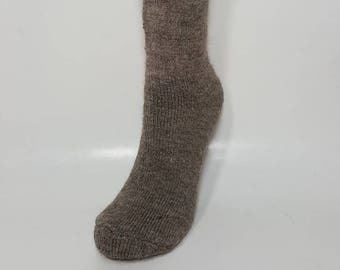 I sorted the fiber by hand removing short bits and debris then sent the fiber to mill to be spun into sock yarn, then the socks were knit with a sock knitting machine with top band folded over and sewn for a clean look. 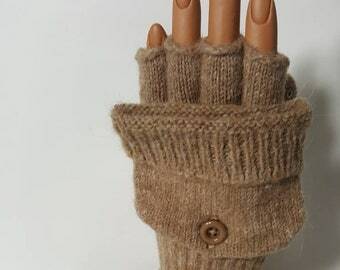 The machine knits the sock into a terry knit fabric with loops of warm cozy natural fibers, giving extra warmth and thickness to the sock for those cold winter days. These are the warmest socks I have ever had on my feet. 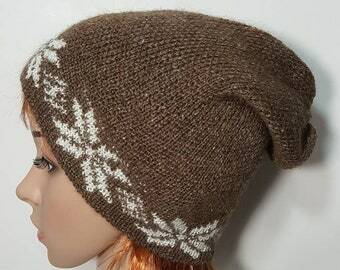 Great for outdoors person or worn inside as a slipper sock. The leg opening is loose and not binding, fits well for diabetics. 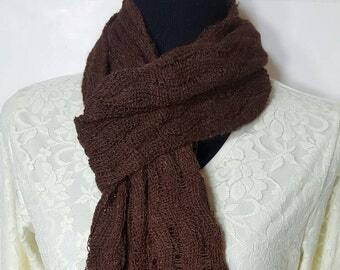 These come in a natural grey/brown color. The photo looks more grey than they actually are. Hand wash, air dry. They will withstand a delicate machine wash but may loose some of the warm fiber qualities and become fuzzy in appearance. I use a laundry bag for delicates and put it them in with other clothes and they turn out just fine. I do hang to dry. 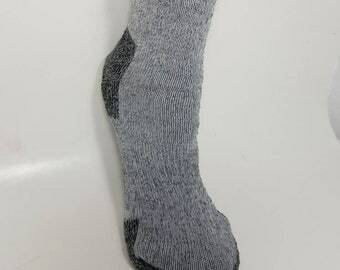 "Fantastic thick and warm socks! I am very happy with these socks and will be sure to get more! Many thanks"
"Awesome quality. Were a bit taller than I was expecting but I bet many people will love that!" Arrived today, beautiful sock, looks great. Great, fast shipping. Great service. This is a wonderfully thick sock, will be great for bedtime or when I'm feeding the sheep & Angora goats! Good job, Connie! These socks are wonderfully warm. And dealing with this seller was a breeze! I was going to return these because they were shorter than I wanted..Though after trying them on I have decided to keep them. 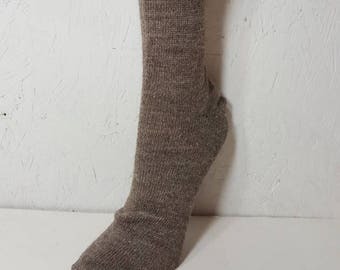 These are perfect for house socks and keep the feet really warm! Arrived today, beautiful sock, looks great. Great, fast shipping. Great service.